This is the time of year where millions everywhere will be packing up and heading to that yearly vacation for a little R&R. What’s your idea of a dream vacation? Is it relaxing at a beach? Time spent at a resort? A cruise getaway? Relaxing on a tropical island? Or maybe just relaxing at home with your loved ones? Whatever your idea of a dream vacation is, just send in a photo to� [email protected] and we will post the photo to our “Dream Vacation” photo album. The picture with the most Likes wins a Katadyn MyBottle Water Purifier! 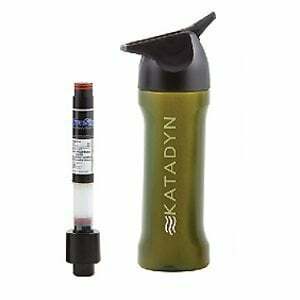 The� Katadyn MyBottle Water Purifier is an advanced personal water bottle filtration system. The MyBottle is the only personal water bottle purification system on the entire water filter market that is registered with the U.S. Environmental Protection Agency (EPA). To use this water bottle purifier all you have to do is fill the bottle with the water you want purified, insert the specially-designed Katadyn purification system to drink from virtually any fresh water source. Voting and submission begins Friday June 1 and will end on Thursday June 7 at 3:00 PM EST. Remember, the photo with the most “Likes” wins so get your friends to Like our� Facebook page so they can Like your photo. Encourage them to participate as well.